For Family Of Drowned Syrian Boy, 'There Was No Other Hope,' Uncle Says Rocco Logozzo talks about his nephew, Aylan Kurdi, whose body washed up on a Turkish beach after a failed voyage from Turkey to Greece, and about the regret he and his wife feel for funding the trip. 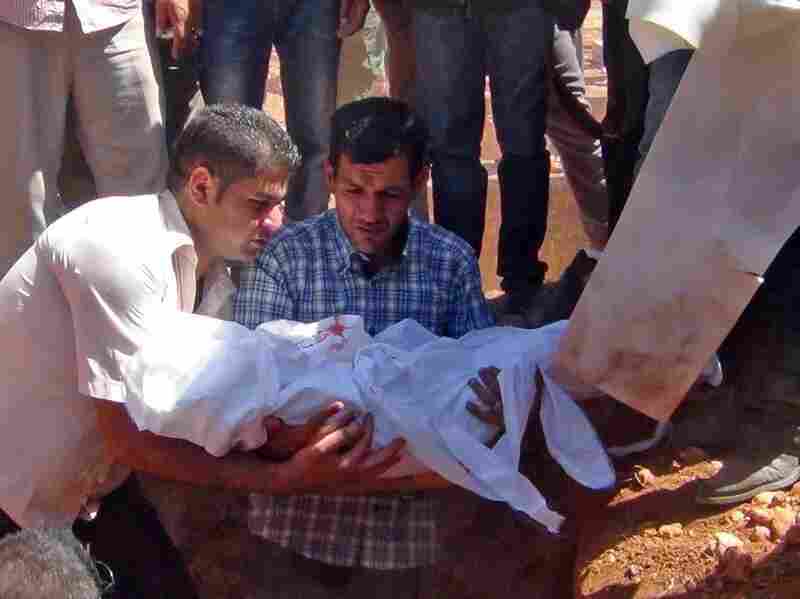 Abdullah Kurdi, holds the body of his 3-year-old son, Aylan Kurdi, during the burial of the boy, his brother Friday and his mother at a funeral in Kobane, Syria. Seeing no other options to help get her brother Abdullah's family out of Syria and to safety, Teema Kurdi sent him money to get them onto a smuggler's boat that would take them to Greece. "We actually would say we encouraged them to go, because his brother made it, and there was no other hope," he told NPR's Rachel Martin in an emotional interview. "We don't see the war ending in Syria; life in Turkey is hopeless." Funding the journey is a decision he and his wife both deeply regret, he says. Their nephews drowned with their mother in the Mediterranean earlier this week, and photos of the body of 3-year-old Aylan Kurdi were published around the world, bringing renewed attention to the plight of refugees from Syria's civil war. "They were happy little boys," he says. "The little boy, the littlest boy, was so excited to get on the boat. He was going to a new place." Listen to the full interview using the player above.